Can’t make the events? Not in Missoula? You can still be a Welcomer! Post Your “I’m a Welcomer” Photos to Social Media! Download our “I’m a Welcomer” signs and print your favorite(s). Take a photo of yourself or your team with one of the signs and post to social media with a caption describing how your community welcomes. We also encourage you to highlight the personal stories of immigrants and refugees and their contributions to your community. Participate in our Statewide Call Day! On Wednesday, September 20th, Soft Landing Missoula, the International Rescue Committee, Montana Women Vote, the Montana Human Rights Network, and many other partner agencies around the state are joining together to call our government representatives to express our support for refugee rights and resettlement. From home, read this post to learn more about issues, which calls need to be made during Welcoming Week, and read suggested language for your call. This is part of a statewide effort that will be bringing many groups from across that state together to make these calls during the week. 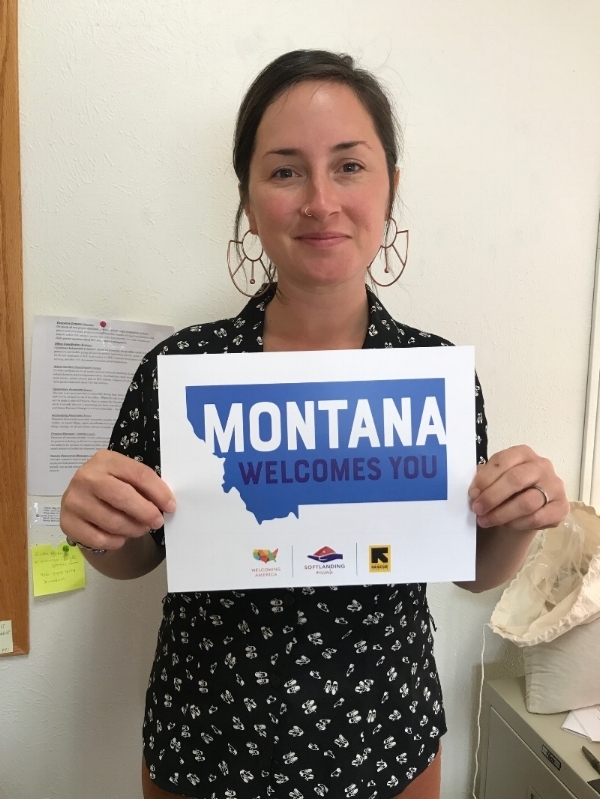 Contact Montana Human Rights Network to find out more information about what will be going on in your area. Pick up your phone and call your government representatives! We are grateful for your support! StoryCorps’ mission is to preserve and share humanity’s stories in order to build connections between people and create a more just and compassionate world. Go to Soft Landing’s Story Corps Community and choose "Join Community" to become part of the official SLM StoryCorps Community, record and share your story, and listen to interviews from other supporters like yourself! These stories will be archived in the American Folklife Center at the Library of Congress. Record your conversation on your phone or on your computer, then upload it on the StoryCorps website. Add the information about you and your interview partner, and make sure you type "Soft Landing Missoula" in the community portion (#8). If you have questions about the process, try StoryCorps' FAQs or contact Carlyn@softlandingmissoula.org. We can't wait to hear your stories! Check out our full schedule of Welcoming Week events in Missoula. Join us in calling to support refugees and immigrants for Welcoming Week!